The P-26A-33 Peashooter is a Rank I American fighter with a battle rating of 1.0 (AB/RB/SB). It was in the game since the start of the Open Beta Test prior to Update 1.29. The P-26A-33 Peashooter is a reserve monoplane for the US Faction in War Thunder. The P-26 series are the only reserve monoplanes available to new players. The difference between the P-26A and P-26B variants are negligible however, one changes included the B variant receiving a fuel-injected engine. Like most US Fighters the P-26A-33 Peashooter is a decent energy fighter even though its high lift creates unstable diving characteristics. Despite being a monoplane, the P-26 is not the fastest starting fighter. In most regards the P-26A-33 will be outmatched by enemy fighters; for example, the Japanese Ki-10s will not only turn circles around the P-26A-33, but will out-climb it and out-run it too. However, the slow German He 51 makes an easy target for a P-26A. P-26 pilots should instead focus on attacking and harassing enemy bombers. Unlike the P-26A-34 M2, the P-26A-33 does not have a 12.7 mm (.50 cal) machine gun. 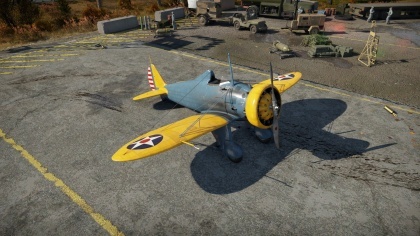 Because both fighters are available at the same time and identical in all other regards, this makes the P-26A-34 M2 the clearly superior choice. The P-26A-33 should be reserved for Arcade Battles as a backup. On this early tier of aircraft any upgrade is valuable and easy to come by. In general "Engine" and "Compressor" are good upgrades, likewise for the "Offensive 7.62 mm belts" and "New 7.62 mm MGs" unlocks. The Boeing P-26 Peashooter was a plane both ahead of its time and quickly made obsolete. First flown in 1932, the P-26 is the oldest plane in the game. 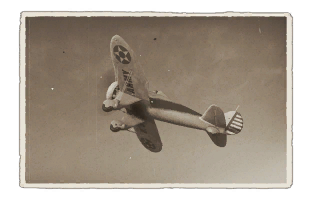 It was one of the first all metal monoplanes adopted into military service in 1933 (In comparison, the He 51 and Ki-10 entered service in 1935), making it one of the fastest fighters in the world at the time, but it suffered from poor flight performance and dangerous landing characteristics. However, as newer fighters entered service around the world, the P-26s advantages diminished and its disadvantages became vulnerabilities. By the time of World War Two, the P-26 was hopelessly obsolete. The P-26 saw the most of its combat serving in the Chinese Nationalist Air Force during the Second Sino-Japanese War, against Japanese Ki-10s, and notably A5Ms in some of the first all metal monoplane dogfights. Although it performed admirably in the pursuit role (bomber interception), in air-to-air combat with Japanese fighters, the deficiencies of the model showed. In US service, the P-26 had a similar record. During the Japanese invasion of the Philippines, the P-26s scored only a handful of air-to-air kills against Japanese attackers. On December 24, 1941, their crews burnt the remaining planes to prevent their capture. Of the one hundred and fifty one built, only nine P-26s air worthy remained on Christmas 1941, a single squadron defending the Panama Canal Zone, which were removed from service shortly after. This page was last edited on 13 March 2019, at 01:18.